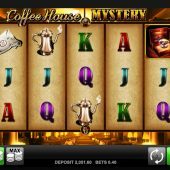 Coffee House Mystery slot is a Merkur Gaming title available online. It has an old fashioned look to it, with sharp-suited characters and symbols from a bygone era. The soundtrack sets the scene for a who-done-it fictional story, taking place at this high-end coffee house. So will this game give us a the hit we might be expecting or will we be left with a bitter after taste? 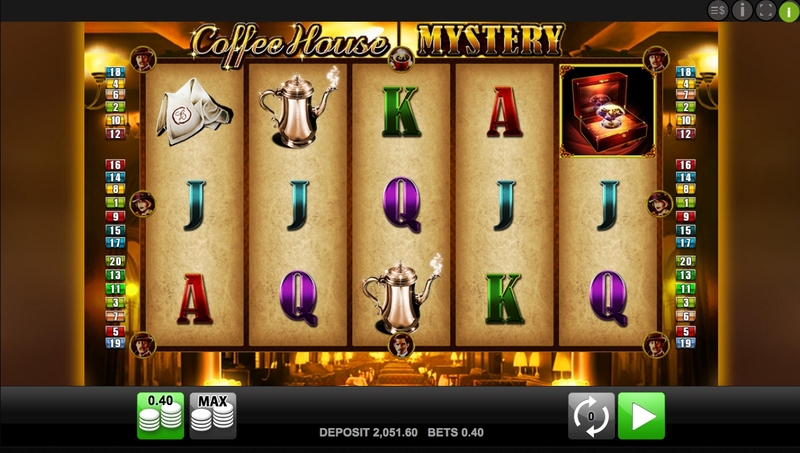 This 5 reel, 3 row slot has a total of 20 paylines, which is fairly typical for this developer. The top paying picture symbol in Coffee House Mystery is the pocket watch, paying 25x for 5-of-a-kind (5OAK). Other symbols such as the coffee pot, cup cake and the napkins pay between 5x - 15x for a 5OAK. Lower paying symbols are the typical A-K-Q-J symbols, offering more meager rewards. Detective Dan - An expanding Wild will appear from one of the four corners of the reels, covering 2 x 2 reel positions. Office John - Appears on reel 3 and will expand the cover the reel with an Expanding Wild. Miss Lucy - Expanding Wilds appears in shape of a cross, covering 5 symbol positions. This will only appear on the first three or last three reels. Espresso - Possibly the best of the lot, you get an expanding Wild covering 9 positions on the middle 3 reels. This particular feature can pay handsomely if the right symbols land on the outer reels. Land the bonus symbol on reels 1, 3 and 5 and you will trigger the free spins feature. You start with 10 free spins, but there is a possibility of re-triggering this feature an additional 2 times. During the free spins you will see two smaller sets of reels and if they have been opened up by the retrigger you could see 15 reels spinning one after another. All of the Mystery Wild features can be activated during the feature as well.